The Woodlands is a former brownfield area in the Newall Green district of Wythenshawe. The site is within close proximity to local businesses, transport links and nearby Milky Button park. It is a large site sandwiched at each end between Hucklow Avenue and Kennett Road. 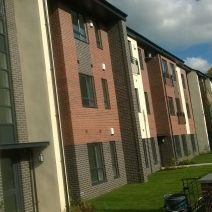 The development will create 52 houses for sale and shared ownership and 78 apartments for affordable rent. All units will have parking areas and landscaped gardens with new trees and bushes planted and is estimated to complete with contractor Lovell Construction in July 2018.